Posted by B. Daniel Blatt at 5:18 pm - March 9, 2012. The individual branded, “fool,” is of course the accomplished and determined reformer currently governing the great state of Wisconsin. This image, however, mis characterizes Governor Scott Walker’s reforms. The legislation that Republicans signed would not deprive any working man or woman of his right to join a union. 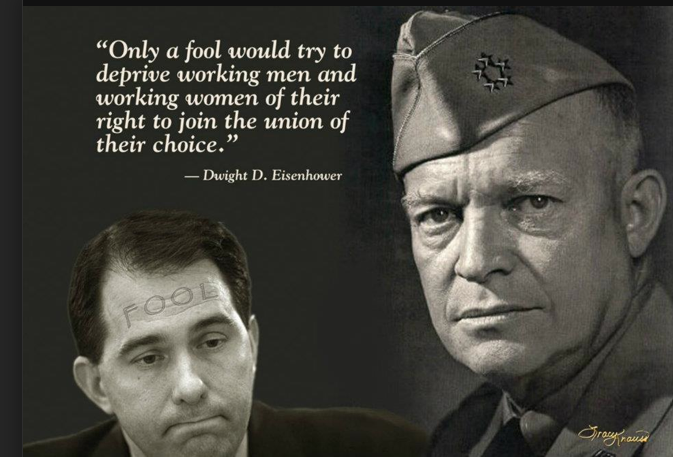 Just as Scott Walker has not conducted a “War on Unions” (as some on the left claim), Republicans haven’t conducted as “War on Women” as many on the left claim. They haven’t even declared a war on contraception. Rather than engage Republicans on the actual issues, e.g., the specifics of Walker’s reforms or the federal government mandating the employment policies of a private institution, our friends on the left, with a generous assist from the legacy media (and some undisciplined Republicans), prefer to cast Republicans conducting a war on the various constituencies Democrats need to rally to win votes. Posted by B. Daniel Blatt at 4:18 pm - March 9, 2012. “The best 12 months” for job creation “in the post-war period”, reports economist Danielle Hall, “were September 1983 to August 1984 when 4.9 million jobs were added.” In September 1983 alone, “the US economy under President Reagan created 1.1 million jobs.” Keep that figure in mind when you hear the media trumpet the latest employment figures. In the past five months, the US economy under President Obama created fewer jobs than the economy under Ronald Reagan did in the ninth month of the third year of his presidency. On that score, he was more prescient that yours truly who contended we would reach that milestone well before Memorial Day, now more than two months hence. Posted by B. Daniel Blatt at 1:06 pm - March 9, 2012. Decided to take yesterday afternoon and the better part of the evening off from politics. Don’t get those who spend their entire day reading about it and obsessing about it. When I did check the blogs as I ate my late-night snack, I caught a few things of interest, one which led me to contemplate a post which, well, Glenn Reynolds had already written by the time I beganmy morning blog read. Pretty much says it all. Democrats won the first round of this fight, by TKO, according to John Hinderaker, but by not leaving the field once they won the game, they snatched defeat from the jaws of victory.